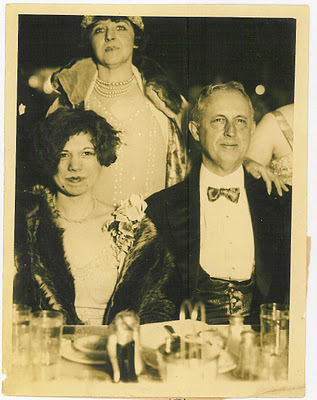 Peaches Browning may have failed in her bid for wealth when her suit for divorce, a property settlement, and alimony against Daddy Browning failed in March, 1926, but all was not lost. Her fame was nationwide now, and her teenage dreams of a stage career on solid ground. Caroline Heenan, Peaches’ mother, who had encouraged her daughter’s relationship with the old goat so as to prevent Peaches from pursuing a questionable stage career, changed her tune fast now that marriage to the elderly Browning had failed to deliver its original, ostensible rewards for the Heenans. An about-face was warranted for the budding performer, now that something of value could apparently be salvaged from Peaches’ acquaintance with Daddy B. At right is a pub shot of peroxided Peaches, circa 1927 just when her vaudeville act took off. Clad in dark velvet, expertly draped to conceal the zaftig nature of her major gams, the now 17-year old Peaches struck a demure a pose on a sawhorse that was surely cropped out of the shot before distribution. While waiting for the trial court’s decision in her marital battle, Peaches and her Momma took a breather from the intense spotlight in which they had bathed since her April, 1926 nuptials. A cruise to Bermuda was just the thing. Here they are in early February, 1927 on the deck of S.S. Fort Victoria. She must have gotten something from the old geezer even though her divorce claim was foundering: perhaps the sale of some of the contents of the 20 or so trunks of finery carted away by her as she and her mom removed from the Kew Gardens Hotel in October, 1926 paid for the undoubtedly expensive passage. Six months of co-habitation with Daddy B. and his puerile antics had been more than enough. Temporary support was substantially denied to Peaches when Browning anticipated his teenage wife’s legal strategy and sued for a separation soon after she walked out.During the pendency of the outlandish legal battle, fought in Carmel and White Plains, New York, wags paved the way for Peaches ’incipient stage career as a flaming chanteuse. 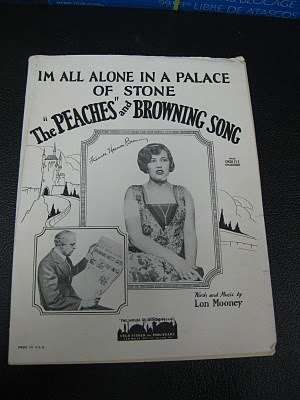 Here’s Lon Mooney’s Tin Pan Alley hit, I’m All Alone in a Palace of Stone, with a morose Daddy staring at the tabloic headlines announcing his beloved’s flight. A winsome Peaches, clad in an unusually matronly frock, looks off into the distance, her grown-up visage belying her sum total of 16 years. Peaches made quite a stir once she started appearing on the regional vaudeville stage. 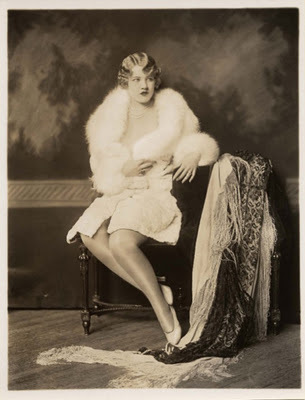 Despite a field crowded with Ziegfeld girls and Busby Berkeley wannabes, Cinderella Wannabe mattered enough for celebrity photographer Cheney Johnston to capture her inflammable essence in this smoking hot studio shot, her sizeable pins again gamely disguised, as she looks off-stage. Peaches had earned her fame the hard way, battling competition at every turn. Browning was no easy catch during their short courtship, having solicited over 12,000 girls in his infamous 1925 newspaper ad that ended with a Czech girl, Mary Louise Spas, supposedly 16, being legally adopted until her true age was smoked out. Here he is in the same season of his and Peaches’ initial acquaintance, clad in what was reported as a gold vest. The satyr is seated next to Miss Ethelinda Cooley, beaming at having brought down the house with his skill as her Charleston partner before a crowd of 1000 at the Commodore Hotel in late February 1926. Check out Mama Cooley’s stern smile behind her daughter’s smiling bee-stung lipped puss, an iron matron’s firm grasp on the white-haired so-called gentleman’s shoulder. Where is sweet Ethelinda’s mother’s other hand? Ready, aim, FIRE, just in case. Even old Daddy wouldn’t have dared fondle Ethelinda’s tight thigh. At least ‘til a bit later…. 15 months later, a lot of water, under the bridge. 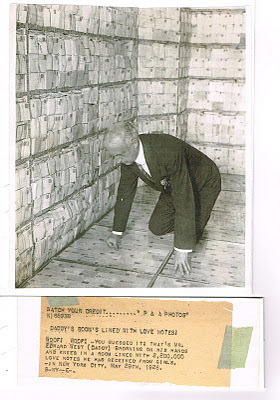 Here is poor old Daddy again, May, 1928, kneeling on the ceiling of a glass vault in his real estate office, where 2,200,000 letters to him from young women all over the world were hoarded and savored by the old Terah. His appetite was never sated, even after Mary Louise Spas and Peaches were long gone. Imagine my surprise when the phone rang this past March, and an old man calling from Florida inquired. “Is this Benjamin Feldman? I’m Warren Lee, and you’re gonna WANT to talk to me. I read your book. I’m in the know.” Warren’s father, Henry Lee f/k/a Hyman Levy, knew Daddy Browning more than well. Back in 1919, Hy was discharged from the Army. An orthodox Jewish boy from Brooklyn was ready to go to work, and his training in the service as a stenographer and typist would come in to play. Edward West Browning ran a large realty empire by that time, but his proclivity for members of the distaff side made it inadvisable for him to have women in his office as employees. Male secretaries were on the outs already in much of this country, but Browning preferred them, and when Hy Levy answered the newspaper ad placed by WASP-extraordinaire Browning, he was hired for the job. Browning may have been anti-Semitic, but he recognized select male members of the tribe as extraordinarily capable. Perhaps Browning’s career as a black sheep in the staid and pedigreed Browning family made him sympathetic to the Jews as social outcasts. Daddy Browning knew smarts and ambition when he saw them, and how to employ them in others for his own uses and aid. By 1926, when Warren was born, Browning had made Hy Levy wealthy, giving him pieces of deals and a healthy salary, advancing him from clerk to appraiser as Edbro Realty Corp. grew. Chartered day-boats up the Hudson River for company parties, lavish presents for children of favored employees, access arranged for Hy Levy to “restricted” uptown clubs were all Browning’s pleasure, his largesse as an employer matching the mis-directed efforts he made with young women. The secret of what possessed his twisted soul would follow Daddy to the other world, as children who benefitted from one of the Browning charities sprinkled white orchids into his grave. With the onset of the Great Depression, Edbro Realty suffered, and Hy Levy left to strike out on his own. Leaving his race-horses at the Belmont track his New York Jockey club membership behind and his wife and two children at their home on 169th Street in Jamaica, Queens, Levy hied himself down to Dallas, Texas, where he was hired as a car salesman by the C.S. Hamilton Chrysler dealership. There was one hitch before starting day, though. Hyman Levy was required to deracinate his last name turning non-Hebrew: H.L. Lee. Gertrude Levy and her sons must joined Hy there, and Warren graduated from a Dallas High School. Lee’s sales acumen was probably considerable: Chrysler took Hy Lee away, making Warren’s father manager of its West Texas Mopar parts division. After being moved for that post to tiny Kermit, Texas, Hy Lee was rejoined by his wife, Gertrude in 1934. Warren and his older brother Robert, both over 18 by then, elected to return to New York, their last names also by then changed to Lee. Warren was born on February 2, 1926 at Eastern Parkway Jewish Hospital in Brooklyn, so it’s likely that the family lived not far away then. The Levys were itinerant, just like Daddy Browning, who rented his many homes despite massive real estate holdings of his own. One of Hy Levy’s perks during his tenure with Edbro was to occupy apartments for short periods in his boss’ holdings. He also took advantage of the liberal free rent periods that were customary in apartment rentals in those days. While Warren was a small child, the Levy family even lived around the corner from Caroline and Peaches, at 654 West 170th Street, and Warren told me that his older brother Robert remembered visiting the Heenan apartment back in the days of Daddy’s courting there. Warren also remembers living in the same Washington Heights neighborhood when he was a grammar school student at P.S. 173, a fortress that still stands on Fort Washington Avenue and West 173rd Street. Warren’s his apartment house neighbor, Neil “Doc” Simon, was teased mercilessly by his older classmates when he brought a new toy doctor kit downstairs to play. Before or after the Levys’ residence at Browning’s typical needle-like apartment house that Edbro built at 42 West 72nd Street, Warren also remembers living at The Majestic, on the southwest corner of Central Park West and 72nd Street. Hy Levy must have been doing quite well! Today, apartments at the Majestic cost $2000 per square foot and UP; even in the Depression they weren’t too cheap. 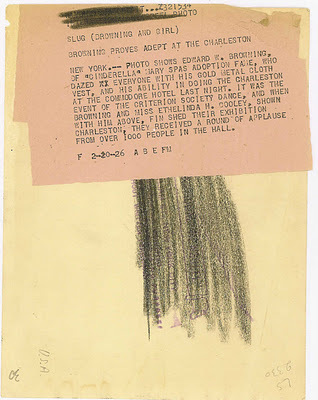 Little Warren, 7 or 8 years old, remembers well the gift one Christmas from Browning of a miniature coal-fired locomotive and tender hitched behind, which his mother would take him in to Central Park, across the street from the Majestic. Warren had to be the envy of even the richest kid on the street, trundling about in this contraption after he visited Browning in his West 61st Street office to thank him personally, with his Mom.